I have two very crazy and goofy sons. Life is never dull and is the farthest away from boring that you can get, which is why I'm still up at 1:00 am. My youngest son just will not go to sleep. He's not crying, just talking. I've done everything I can: milk, playing, rocking, etc. Now, I'm just giving him time to see if he'll finally fall asleep this time. While waiting, I dumped all the pictures from my camera, and I couldn't help but chuckle as I remembered what was happening when those pictures were taken. Then, last week, when I was at Mom and Dad's, Dad came out to the van to tell the boys, "Hey!" He opened the door and asked what was on Peter's mouth. I looked back there, and he had been eating his shoe!! He didn't just chew on it; there were actual chunks missing from the flip flop and were being chewed in his mouth. I have no idea what possessed him to eat his shoe, but now, I have to remove his flip flops while he's in the car seat. I've also decided that I have absolutely no idea how they sleep and don't wake up with back pains. I went to check on the boys before I went to bed a couple of nights ago. I always check on them and find them in super funny positions, but that night was definitely the strangest I've seen Peter sleep. He fell asleep on his side with both legs hanging out of the side of the crib and through the same slat. He had to have gotten into that position while awake and then fell asleep that way. There is no way that I could have fallen asleep, but he did. Yeah, my boys are silly but ever so adorable!!!! YAY!!! Titus's doctor's visit went well:) His chin bump is just a hematoma. It'll take a couple of weeks for it to clear up completely. I just have to put warm compresses on his chin during nap time and bed time. I'm going to have a lot of fun keeping that on his chin:) He uses the entire crib while he's sleeping. I just hope by the time he gets married that his sleep has settled down some. Also, his congestion and cough came back; so, since we were already going to the doctor for the chin, it worked out for his congestion. And (I know is going to sound bad) he was actually running a fever while we there:) Which means, they actually were able to help his congestion and prescribe something for him. Normally, I would make a doctor's appointment; and by the time of the appointment, he wouldn't be running a fever anymore. Then, I feel awkward taking my fever free child to the doctor. Hopefully, this new medicine will clear him up completely and quickly. Tomorrow, I get to make another doctor's visit run with Titus. He fell in the bathtub on Saturday and hit his chin. I checked him but didn't see anything. Monday, I felt something under his chin; he has something protruding from his chin that feels like bone. It's not breaking through the skin and is leaving a red spot where it's been rubbing. Fortunately, it doesn't hurt for me to touch it, but it does hurt when he falls and hits it. I watched it Tuesday just to see if it would go down (high hopes), but it hasn't. So, I called the doctor today, and they told me to bring him in Thursday for them to check it out. Peter, on the other hand, has not had doctor's visits except for well check-ups. He's a little more timid and thinks things out before he does them. You can see the wheels turning in his head as he's watching. He's going to be my thinker. It takes him longer to learn to do things than it does Titus, but he usually does them better than Titus once he starts. It took him longer to learn to roll over than it did Titus; but once he got going, he would roll from one side of the room to the other. So, the boys have effectively learned how to take their own diapers off no matter what happens to be inside them. The days of letting them run around in just their diapers are "gone with the wind." I use to take their clothes off, put them in their beds, and then get their clothes out of the closet. 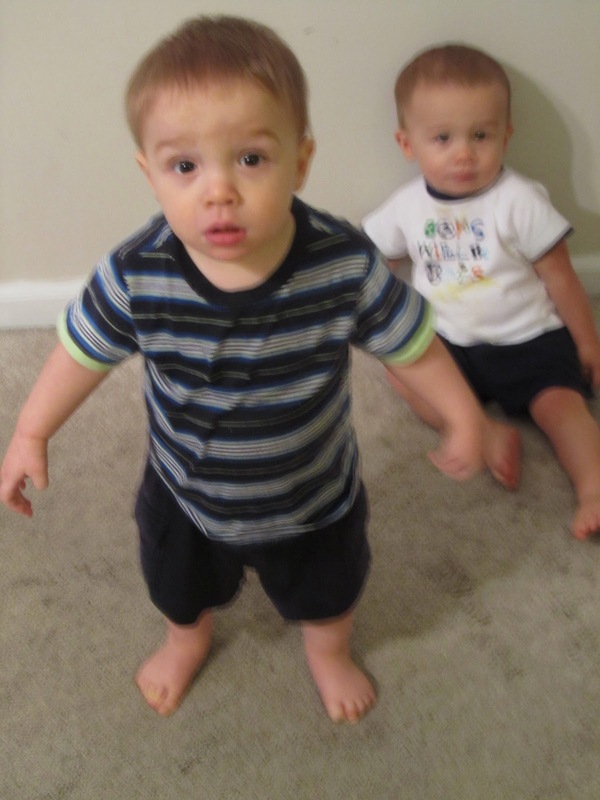 In less than 30 seconds, both boys can have their diapers off and out of the crib on the floor. Fortunately, they haven't played with the poopy ones:) Peter took one of his poopy diapers off today and brought it to me which is a good thing for me. However, once the diaper comes off and the cold air hits, you never know what will happen! Saturday night, I was bouncing the ball on the hardwood floor next to the front door. They think it's hilarious, and we were having a good ole time. I looked over, and Titus's diaper was laying on the floor. Somehow, he had managed to un-velcro his diaper and wiggle it out the leg hole of his romper. Just as I noticed it, he started relieving himself. As I hollered for Daniel, both boys lock eyes and think, "Let's splash in the puddle!" Dan arrived with the paper towels and cleaner just in time to see both boys splashing in urine as I'm trying to pull both of them away from it without getting the carpet wet. AHHHH!!!! Needless to say, bath time got bumped up an hour, and our entry way was spotless soon afterward. 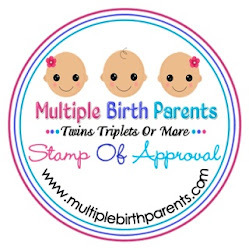 Once I found out that I was going to have twins, I began reading everything about multiples and asking everyone with multiples as many questions as they would answer. To my chagrin, I read and heard a lot of horror stories. Very few articles and even fewer people had stories of the good times. I was terrified and contemplated how to keep them inside longer. Once they came, the first few weeks were difficult; but once we established a routine, it's been pretty much smooth sailing. Don't get me wrong, there have been plenty of bumps in the road, but nothing compares to the stories I was told. 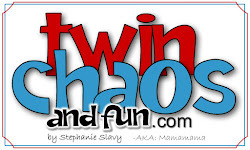 So, here's my attempt to help women who just found out they are having twins. 3. Color code as much as you can. For me, each boy had a different pacifier strap color, and I was a stickler for making sure the right pacifier was on the right baby. The first thing that I wanted to accomplish was that each boy had his individual things. I want them to be considered individuals and not one entity. The second thing that I wanted to accomplish was a way to tell who was who. For the first couple of months at church, everyone would look for the pacifier strap to remember who was who. Peter had the blue pacifier strap, and Titus had the orange one. I also color coded their sippy cups and baby blankets. 4. Label as much as you can. Since many times one baby is bigger than the other(s), labeling comes in very handy. Gallon size zip-loc bags are the easiest to label things in the diaper bag. If they are in different size diapers, put the different sizes in the bags and label them with the correct name. Also do this with extra clothes in the diaper bag. This saves you time and the person who may be helping. You won't have to sort through a big mess in the diaper bag to find what you're looking for. 5. Remember size difference affects everything. I didn't think about the size difference until I went to put them in their car seats for the second time. The first time was no big deal because we had to adjust the straps to fit them. Then, I went to put them in their car seats the second time and had to guess which one was adjusted for Peter and which was one was for Titus. After that fiasco, I attached a monkey rattle to Titus's car seat and a zebra rattle to Peter's car seat. This was also another way people remembered who was Peter and who was Titus. Also, many people have a tendency to throw away the hangers that baby clothes come on. Don't! This is a quick way to make sure that you are picking up the correct size. Ever since the boys were around three months old, Titus has been wearing clothes a size or two bigger than Peter. Since I kept the clothes on the hangers they came on, I'm able to pick out the sizes better. 6. Let people help. If they offer, let them help. Of course, there will be those times that you'll have to ask, and most will be more than willing to come help. The first few months are when you will need the most help. My mom came over around 9:00 am, a friend relieved her after lunch, and my husband got home around 5:30 pm. I wasn't by myself very much the first few months. Some people even came over just to clean and bring dinner. Now, I like my house cleaned a certain way with certain products used, but I had to allow them to help in their own way. Which means that I had to allow them to clean their way and not stand over them and make them do it my way. 7. Don't let yourself be trapped. If you feel trapped, your twins will feel it too. Go somewhere; do something, even if it's just a quick trip to Wal-mart. Of course, going places is easier with an extra pair of hands, but I can go places by myself with the boys and come out unscathed. The trick is to feed them right before you leave the house. Full babies are happy babies! I was talking to a cashier at Wal-mart a couple of months ago, and she said that she didn't go out with her twins by herself until they were two years old. Don't let yourself be trapped by your twins. They aren't trapping you; they're adding spice and adventure to what was a rather dull life. Take them out by yourself and see what happens, just be prepared for all the questions from inquisitive minds. By no means, have I been totally stress free and made no mistakes over this past year, but I have done a lot of trial and error that I can help you avoid. Raising twins is definitely a lot of work; but if they're your first like me, you don't know how hard you really have it:) And check back regularly for more tips on raising twins.